Better connect with your local community through Facebook focuses on how clubs and districts can use their Facebook page to effectively engage with their local community and built reciprocal relationships. The power of images: Telling Rotary’s story through social media will guide viewers through the process of using powerful and engaging images to tell Rotary’s story. The first vignette is now available on Vimeo http://vimeo.com/91755618 . 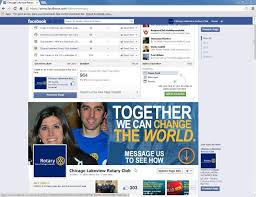 It will be promoted via Rotary’s Facebook page and @rotary on Twitter. The second vignette will be available in two weeks. In the first video learn about connecting with your community using a Facebook page for your club or district. The video shares some strategic tips to engage locally and build relationships with local community organizations. Have you ever thought abut adding a little bit mre than just your articles?